This week I was saddened to learn from her daughter that Jill Goodwin, author of “A Dyer’s Manual”, died on March 23rd at the age of 95. “A Dyer’s Manual” is a classic in the natural dyeing field and was a vital source of inspiration and information for me and so many dyers of my generation and also for the generation of dyers that followed. Without this book, which is full of Jill’s knowledge and experience presented in a clear and direct manner, I would certainly not have had the information or motivation to experiment with dyes from plants. Whenever I visited Jill – and I wasn’t able to do so very often – she had more dyed samples and hand-made treasures to show me and she was always keen to hear about my latest experiments. She was in contact with dyers from all over the world and shared her knowledge readily and enthusiastically. The breadth of her experience was vast and her advice was always useful and to the point. I will miss Jill and I feel privileged to have known her. I am grateful for all that I was able to learn from her over the decades and I am sure that “A Dyer’s Manual” will continue to inspire dyers for many years to come. 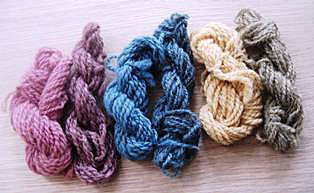 The first skein in each pair shows the dye colour on white wool and the second skein shows the dye colour on light grey wool. All the skeins are unmordanted. I find alkaline modifiers extremely useful, especially when used on fibres that have not been mordanted with alum. Even when the colour on the dyed fibres looks rather insipid initially, an alkaline modifier can often deepen and brighten it. 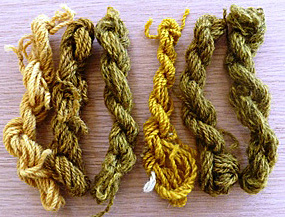 The results of alkaline modifiers on naturally-pigmented wool are particularly pleasing, as I think the samples above show.